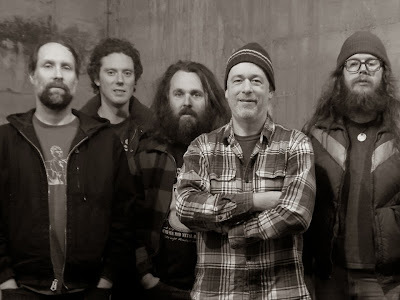 It's been a full four years since Idaho-based indie rock staples Built to Spill released their last proper studio album, 2009's There Is No Enemy, not that you'd know that simply by surveying the crowd at this well-attended Turner Hall show. It's a testament to the band's lasting, wide-ranging influence, pitched somewhere between accessible jam band spaciness and off-beat, Pavement-style alternative, that they're more than capable of packing a house whether they've got something new to present or not. It's the point a lot of bands reach and then just start coasting, confident that their faithful audience will be there through thick and thin, but Doug Martsch and company aren't resting on their laurels just yet, delivering an impassioned performance that showed BTS to still be a vital band, if not a productive one. Perhaps just to get it out of the way, the band, after an epic bout of guitar tuning, got down to business with a few cuts off of 1998's classic Keep It Like a Secret, such as "The Plan" and the classic rock-quoting "You Were Right". The shoulder-to-shoulder crowd, who were almost exclusively white, as if that should come as a surprise to anybody, seemed to take the leap into well-worn material as a gift, and showed their appreciation further as the band wound their way through an eclectic set that of course touched on "new" songs like There Is No Enemy's "Planting Seeds". The intricate, almost brittle interplay of the three guitarists, along with Martsch's nasally emotive voice, are the big selling points of their sound, and both came through loud and clear. There were admittedly a few moments where they gave over to indulgent noodling, but they never lost the plot completely, and the relatively new rhythm section of bassist Jason Albertini and drummer Steve Gere deserve a lot of credit for that. However, it was somewhat predictable, not surprising for a band without a new release to be touting, at least up until the usually obligatory encore, which they used as an opportunity to cut loose on a handful of covers, including Blue Oyster Cult's "(Don't Fear) the Reaper", the Clash's "Train in Vain" and "Sludgefeast" by Dinosaur Jr. among others. It was an unexpectedly fun coda to what, for many longtime fans, might well have been just another Built to Spill show, proving there's a great deal of life left in this venerable act.